During the Mesolithic, the climate in Britain became warmer and wetter than it is today. This led to changes in the vegetation of Wales with the development of a wooded landscape. At the height of the last Ice Age, around 18,000 years ago, Wales was uninhabitable; ice sheets covered almost the entire country. Towards the end of the last Ice Age, between 12,000 and 15,000 years ago, as the climate became warmer, people returned to live in Britain. As the ice sheets retreated north, people recolonized the land, with the first evidence for occupation in Wales coming from caves, dating to around 15,000 years ago. About 2,500 years later the climate improved significantly and the population of Britain rose as a result. Around 12000 years ago sea levels increased, along with need for adapting to changing environment and to differences in the prey of the hunters, which led to the miniaturisation of the flint artefacts and the development of microlithic tools, the inspiration for which was derived from earlier Palaeolithic tools. There was a lesser cold period from about 12,000 to 10,000 years ago but settlement seems to have continued in this period. Around 10,000 years ago the ice age finally ended and the Holocene era began. Temperatures rose and forests expanded further. The Palaeolithic Age came to an end at this time with Mesolithic (or Middle Stone Age). The term Epipalaeolithic (after the Palaeolithic) is used for those cultures that were not much affected by the ending of the Ice Age (such as in Western Asia) and the term Mesolithic is reserved for Western Europe. The Mesolithic lasted until the introduction of farming around 6,000 years ago. During this period, Britain was still attached by the landmass of Doggerland to the rest of continental Europe. 8300 BC is generally reckoned to herald the start of the warmer Flandrian period, which remains today. Today's post glacial warm period began quite rapidly at this time and the treeless British landscape was gradually replaced by trees colonising from the south east. Juniper was the first tree to return, quickly followed by birch, hazel, pine, willow and alder. In the lowlands, oak, elm and pine dominated the landscape, while in the uplands pine and birch were more common. This heavily wooded landscape was home to red deer, roe deer, wild cattle and pigs, all of which were potential prey for Mesolithic hunters. It is likely that parts of the woodland in upland Wales was deliberately cleared in order to promote fresh plant growth which would attract grazing animals that could then be hunted for food. The first forests were of birch, an arctic tree, pollinated by wind as it was still too cold for insects in Britain. By 7,500 BC, the rising sea levels caused by the melting glaciers caused Ireland to be separated from Britain and, by around 6500 to 6000 BC, the plains of Doggerland were submerged and the land-bridges to continental Europe were covered for the final time. The warmer climate changed the Arctic environment to one of pine, birch and alder forest; this less open landscape was less conducive to the large herds of reindeer and wild horse that had previously sustained humans. Those animals were replaced in people's diets by pig and less social animals such as elk, red deer, roe deer, wild boar and aurochs (wild cattle), which would have required different hunting techniques. By 6500 BC mixed oak forest was the dominant form of landscape. Small leaved lime trees had arrived in Britain and the warmer Atlantic period lasted until 3,000 BC. The lime is an insect-pollinated which indicates that the British climate could now support an insect population. 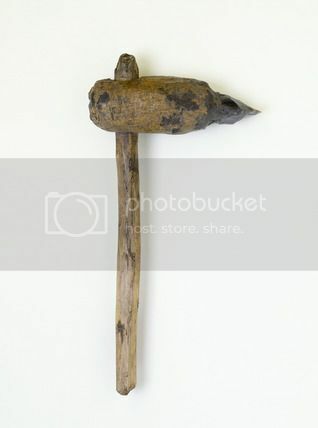 Tools changed to incorporate barbs which could snag the flesh of an animal, making it harder for it to escape alive. Tiny microliths were developed for hafting onto harpoons and spears. 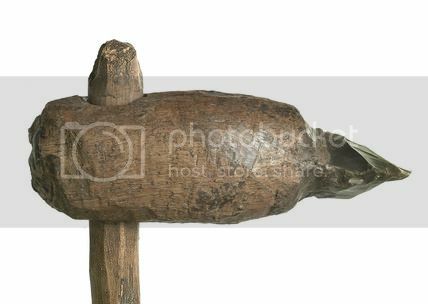 Woodworking tools such as adzes appear in the archaeological record, although some flint blade types remained similar to their Palaeolithic predecessors. The dog was domesticated because of its benefits during hunting, and the wetland environments created by the warmer weather would have been a rich source of fish and game. It is likely that these environmental changes were accompanied by social changes. Humans spread and reached the far north of Scotland during this period. Mesolithic Britons were no longer purely nomadic but were living a more complex life of seasonal occupation or, in some cases, permanent occupation. Travel distances seem to have become shorter, typically with movement between high and low ground. Wrexham, as a settlement, has been around for a long time. With the lowlands being thickly wooded, Wrexham's strategic position on the rising, but still fertile open ground, before the moors and mountains, was the last bastion for ancient tribes being pushed ever westwards. Beyond lay a sparse existence in the 'highlands'. The last Ice Age retreated some 10,000 years ago, leaving large tracts of clays, sands and gravels in the Wrexham area and it even changed the course of the River Dee as it had previously flowed south from Chirk, to join the River Severn, but the glacial moraine blocked its path and turned it north to make its present course. The earliest dated Mesolithic site in Wales is Nab Head, Pembrokeshire, around 9,200 years ago. Many of the sites from this period are coastal, although 9,000 years ago they would have been some distance inland from the sea. There is a particular concentration in Pembrokeshire, but there are also a good number of upland sites, most apparently seasonal hunting locations, for example around Llyn Brenig. Some decorated pebbles found at Rhuddlan represent the earliest art found in Wales. 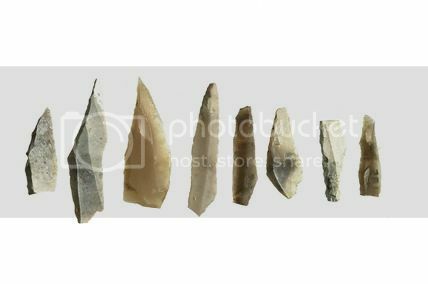 During the Mesolithic period there was a miniaturisation of the flint artefacts, which has been attributed to differences in the prey of the hunters. Hunters of the Mesolithic period have been identified at several sites in North East Wales and inland campsites have been found in the uplands, in sites at Waun Fignen Felen and Llyn Aled, and in the lowlands at Gwernvale and Tandderwen. The introduction of a farming economy is one of the major developments of human history, yet the process by which man changed from an essentially passive user of his environment to an active manipulator of plants and animals is one which is poorly understood. The appearance of new crops and domestic animals must indicate some colonisation from Europe where farming had been established for at least two millennia before its adoption in Britain in the 4th millennium BC. But the extent of his colonisation is disputed, for native hunting groups may have been taking some steps towards permanent settlement and animal control without the stimulation of introduced ideas. Excavations undertaken in 1991–93, inland from the present-day coastline of North Wales, have revealed a number of shell middens of the Mesolithic and Neolithic periods, between about 4500–3300 BC. Previous excavations have revealed evidence of even earlier Mesolithic settlement, dating to between 7900–7500 BC, slightly further inland. The heaps of shells, discarded once the shell-fish had been eaten, were found within peat deposits overlying marine clays, and show that considerable changes have affected the coastline since earlier prehistoric times, before the present system of sand-dunes had developed. The Mesolithic middens were largely composed of mussels, suggesting that there was a rocky coastline in the earlier 5th millennium BC. By contrast, the Neolithic middens are largely of cockles, showing that sandy beaches had developed by the early 4th millennium BC. The middens relate to settlement evidence slightly further inland, represented by scatters of chert and flint tools.